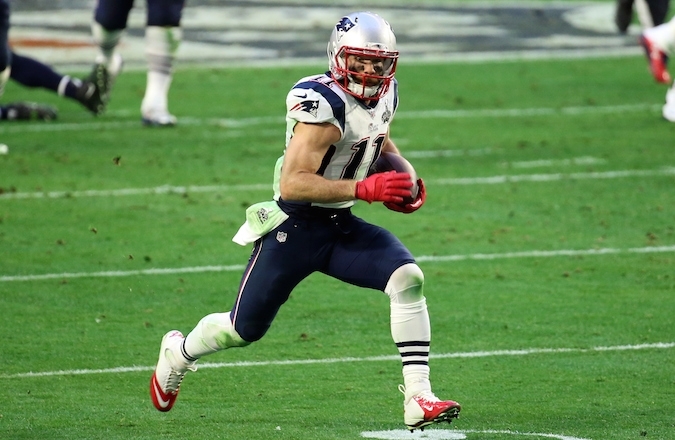 (Updated) During the Super Bowl Sunday night, many Jews across the country no doubt had the same question: Is Patriots wide receiver Julian Edelman Jewish? Edelman had an excellent game Sunday night, catching nine passes for 109 yards and a touchdown in New England’s dramatic comeback victory over the Seattle Seahawks. He also happens to have a Jewish-sounding name. But is he actually a member of the tribe? For the record, while traditional Jews believe one must have a Jewish mother or convert in order to be considered Jewish, both Reform and Reconstructionist Jews recognize patrilineal descent. He played quarterback in college. Before shifting to wide receiver in the pros, Edelman was a quarterback for a year at the College of San Mateo in California and three years at Kent State. During his senior year at the Ohio school, he also led the Golden Flashes in rushing yards. No word on whether he also showed up at the campus Hillel. He was not expected to do well in the pros. Scouting reports from 2009, the year Edelman entered the NFL draft, called him too small and said he would not be a high-impact player. Edelman was not even invited to participate in the NFL Combine, a show of physical tests for professional scouts. He was drafted in the seventh and final round. His father (not exactly your stereotypical American Jewish dad) became an auto mechanic at age 14 but pushed him to succeed. ESPN ‘s Jackie MacMullan expanded on the influence of Edelman’s father, who pushed the future star to tears while training him. Not much to explain here except that Edelman is noted for his constant hustle and energy. Who knows? Maybe Tom Brady’s menorah will inspire Edelman to become more involved with his Jewish side.